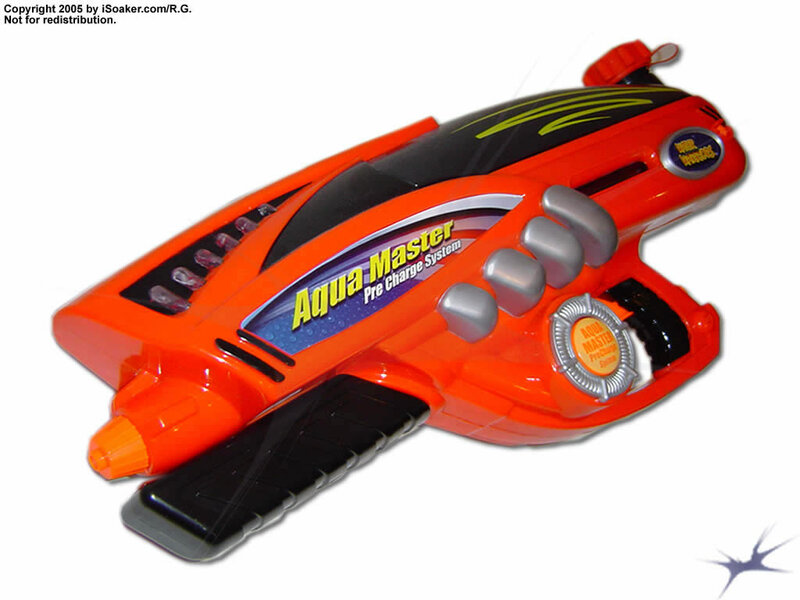 The Water Warriors Aqua Master Pre-Charge Xenon is the mid-sized, mid-powered member of the 2005 Aqua Master Pre-Charge line by Buzz Bee Toys. This line employs a new system of pressurizing water in the firing chamber. As opposed to simply pumping in water into a firing chamber and compressing the air that was in there, the Aqua Master Pre-Charge line allows one to first pre-charge the 'back side' of the firing chamber, thus increasing the amount of pressure initially available when starting to pump in water. This is similar to pre-pressurizing one's soaker when using blasters with separate firing chambers. However, unlike pre-pressurizing, one will not get mist shots with the Aqua Master line since the pre-pressurized air is kept separate from the water in the firing chamber. The overall effect is better performance, though the increased stream power still does not perform as well as the Hydro Power or CPS-system when it comes to consistency of pressure. The Xenon features a single setting. While relatively small in diameter, the mechanism employed by the Pre-Charge line means that the stream produced has a smooth consistency previously only seen on CPS or Hydro Power-based soakers. Separating the pressurized air from the water yields less froth and no accidental misting. As noted above, the special feature of this series is the ability to pre-charge the back-side of the firing chamber. This is done by pressing a large button on the size of the blaster, switching the pump to air and pushing in water into the rear of the firing chamber. A sliding piston divides the two halves of the firing chamber, keeping the water and pressurized air separate. One continues to pump until this button pops back up, signalling that adequate pre-pressure has been achieved. The firing chamber, however, is actually on the small side despite the large volume held in the reservoir. While the smaller firing chamber volume means more full shots per fill, each full shot has a more limited amount of soaking power available. However, there is one major drawback to this system as noted below. The pump for the Xenon is relatively long and pushes a decent amount of water if using a full stroke. However, due to the extended red housing that protrudes from the front of the blaster, the pump grip may hit the end of the housing, giving a slight awkward feel. Pre-pressurizing the firing chamber is done fairly quickly. The box recommends pre-pressurizing before filling the reservoir. However, it appears that when the button is pressed, the intake for air is not from within the reservoir, thus reducing the likelihood of accidentally pumping water into the back-side of the firing chamber. 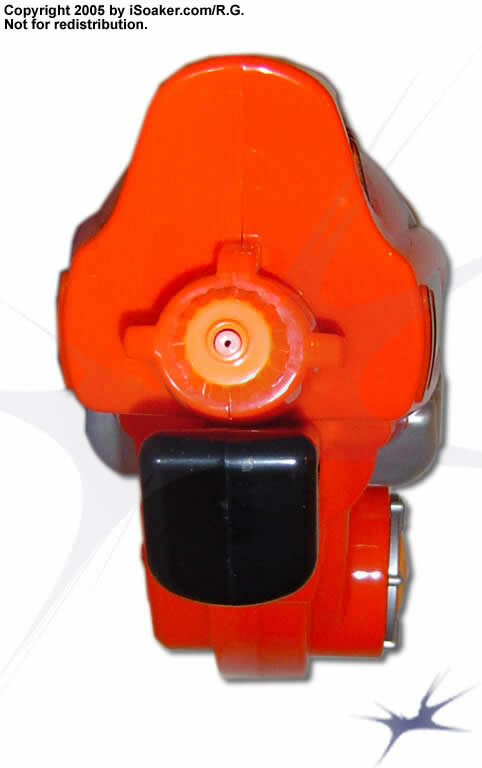 Air-pressure can be released by pressing a small orange button near the back of the blaster. On the box, it notes that after pre-charging, the blaster can then achieve full pressure by just a few additional pumps of water. The problem with this system is that due to the now increased pressure in the firing chamber combined with a fairly substantial pump volume, these few additional pumps are more difficult to accomplish. The force required to reach full pressure is much larger than those unfamiliar with this system will be used to. The Xenon, thankfully, does not suffer as much as its larger brother, theWater Warriors Aqua Master Pre-Charge Krypton, in terms of rock-hard pumping. However, pumping definitely has more resistance than most air, CPS, or Hydro-Power soakers. Note: There is a way to adjust how much pre-pressurizing one does. This method is somewhat subjective and will require testing by the user at different levels to determine what amount works best for him/her. Basically, as opposed to pre-charging the blater right away, fill the reservoir and pump up the firing chamber with water. You will see the piston divider slliding along the transparent region. For greatest pre-charge, the piston should be closest to the nozzle (i.e. no water should be in the firing chamber). If there is some water there, it needs to be removed by pumping air into the front-side (done best using an empty reservoir) and expelling any remaining water prior to activating the pre-charge button. For the lowest level of resistance, no precharging should be done (thus the pre-charge button is never activated). The Xenon will still function even without precharging, but its performance is significantly reduced. For mid-levels, different amounts of water should be pumped into the firing chamber, then the orange pressure-release button should be pressed to equilibrate the back-side of the firing chamber with atmospheric pressure. Finally, the pre-charge button should be depressed and the back-side should be pressurized with air until the button pops back out. While this will reduce the overall effectiveness of precharging, it will make pumping easier. One just needs to find a good level of compromise between ease of pumping and blaster performance. There are two triggers on the Xenon: one controls the nozzle valve while the other activates the electronic pressure gauge. The electronic pressure gauge is housed within the forward-top portion of the blaster, making it easy to see. Colours change from yellow to green as maximal pressure is achieved. In bright light, however, the different may be a little difficult to discern. The placement of the electronic-pressure gauge trigger on the back-side of the grip feels somewhat uncomfortable, especially after prolonged use. This placement also means one tends to continually activate the pressure gauge when holding the blaster even when one is not pumping. This will undoubtedly use up the batteries more quickly, though approximate battery lifetime remained unknown. The bottom of the grip is attached to a forward part of the underside of the blaster. While the area is limiting and may not accomodate larger hand sizes. Older users may find their pinky finger below the base of the blaster when using. Similar to the Water Warriors Blazer, the Xenon's reservoir is relatively large, top-mounted, and opaque. One nice feature is the tethered cap that reduces the chance of losing the reservoir's cap. However, the tether is made of a piece of external plastic akin to some sport-bottle caps and may get damaged if hit. The reservoir has a gerat capacity, but being top-mounted, makes the blaster feel top-heavy when filled. As a whole, the Water Warriors Aqua Master Pre-Charge Xenon is a good, solid soaker. Performance-wise, the stream behaves better than other air-pressure soakers and act closer to CPS-type power without being CPS-based. Were it not for the limited firing chamber, the Xenon would receive a much better overall rating. Recommended for most water fights, the Xenon should be able to hold its ground against most blasters of its size. Pre-charge system separates the pressurized air from water, reducing misting and improving general stream performance. Has large reservoir and good pump volume. Can be very difficult to pump when fully pre-charged. Slight lag when pumping quickly (assuming this is possible). Small overall firing chamber volume. Opaque reservoir makes judging fill level difficult. Pressure gauge requires batteries to function. After being a bit disappointed with the Aqua-Masters precharger Krypton and it's rock-solid pump, I was a little worried that it's smaller brother the Xenon would be more of the same. Thankfully this wasn't the case and has actually turned out to be a really great gun. This gun is the middle-sized blaster of the precharger line, it's overall size being between the XP 270 and XP 310. The 1.2 litre reservoir is just the right size and the Xenon is very well balanced and easy to hold one-handed. Despite the gun's smaller size, however, the stream produced is very powerful. A side-effect to this is that the stream isn’t very cohesive, especially since the nozzle is relatively small. Fortunately, the gun still gets good range so it isn’t really a problem. Another of this gun's strong points is its very quick reload time; around 4 pumps and the pressure chamber is full. While the pressure chamber is only about 130 mLs, reloading it is fast enough that this isn’t a problem at all for me. One gripe that I have with the Xenon however is that the trigger-grip area is not very comfortable; it's quite small. The rear facing power-meter trigger tends to dig into my hand which gets a bit sore after a while. Overall, I really like this gun. It's powerful, light, and very easy to reload. While some may be put off by the relatively small pressure chamber, I don't see it as a problem as the gun can be pressurized in a flash. Definitely a good buy for someone looking for a powerful rifle in a small and easy to carry package.